What does a healthy breakfast mean to your family? I was recently asked that question for an article in the Burlington Free Press. Healthy food is still evolving in my kitchen but for the most part it is related to emphasizing whole ingredients and making things from scratch. I told Hannah Crowley, the Free Press correspondent, "I think everyone has a different take on healthy; for me healthy means no processed ingredients, no high fructose corn syrup or trans fat. In general if I don't understand what's on the label, I don't cook with it." I also spoke of the pancakes and muffins we often have for breakfast. 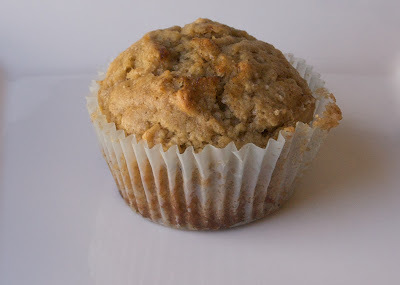 My recipe for Banana Greek Yogurt muffins was published along with the article. These muffins are just my latest tweak to my regular Sour Cream Banana muffins, using more white whole wheat flour and Greek yogurt in place of the sour cream. When I read the article I thought my "healthy breakfasts" sounded decadent next to some of the meals described by Jodi Whalen of August First Bakery and Dianne Lamb, UVM Extension Nutrition and Food Specialist. However I still feel comfortable feeding that to my family (as well as the preschoolers at work). Really a healthy breakfast needs to get you started for the day with enough energy to last until lunch. 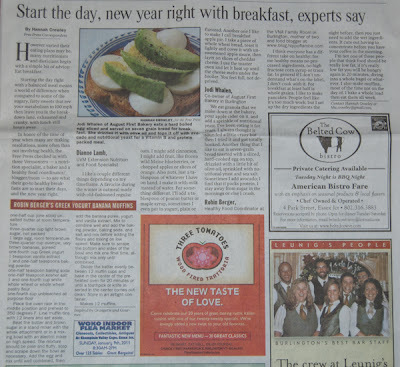 You can read the Healthy Breakfasts article and decide for yourself. Turns out my friends comments on facebook when I posted the link was not the only attention it would receive. When I checked my e-mail that afternoon I was surprised to find an e-mail from the corn refiners association in my inbox. I am just in awe of a P.R. budget that can respond to negative press in smaller newspapers. The fact they responded with out of date studies and propaganda beside the point. I am writing on behalf of the Corn Refiners Association, which represents the manufacturers of high fructose corn syrup in the United States. We read that your quote, “…for me healthy means no processed ingredients, no high fructose corn syrup or trans fat” with interest (January 7 Burlington Free Press “Start The Day, New Year Right With Breakfast, Experts Say” by , Hannah Crowley). There has been a lot of confusion about high fructose corn syrup. If your schedule permits, I would be happy to speak with you regarding the information below and any other related topics on this safe sweetener. It is a popular misconception that high fructose corn syrup is more ‘processed’ than sugar, fruit juice concentrate, or agave nectar production. In fact, they all go through remarkably similar production methods that aim to refine the raw botanical material into a robust and versatile sweetener that can be formulated into a wide range of foods and beverages. To read the latest research and learn more about high fructose corn syrup, please visit www.CornSugar.com. Please feel free to contact me if you would like additional information about the products made from corn. I was actually pretty happy, even excited, to receive this e-mail. For one I am more then happy for the corn refiners to think of me as a problem, I am actually pretty proud of that distinction. In addition their worry over every small negative comment is a sign that people are starting to avoid their products and they are worried. As for their claims of it being equivalent to sucrose or table sugar, there are more and more studies that say the opposite, no matter how much money they may put into biased studies. Rutgers University completed a study that found a link between drinking sodas with high fructose corn syrup and the development of diabetes, an illness that is quickly reaching epidemic levels in this country. Scientists at Princeton University studied the effect of diets high in high fructose corn syrup as compared to table sugar or sucrose. They found rats who were fed HFCS were significantly more obese than rats fed table sugar or sucrose. The corn refiners association would like us all to believe that their products are no worse for you than table sugar. The obesity epidemic in this country being related only to how many calories we are consuming, not what type they are. I believe in general we need to reduce sugars in our diets but in addition I still believe the best practice is to eliminate High Fructose Corn Syrup and any other food that requires chemicals or procedures not possible in a home kitchen to make them. Feel free to read the Princeton University Study on High Fructose Corn Syrup yourself. Even if these studies are not accurate, eliminating high fructose corn syrup from your diet will still improve your health. When you eliminate high fructose corn syrup from your diet you are forced to avoid some of the most processed nutrient empty foods from your table. I have been making these for the preschoolers breakfasts and sharing the extras with the staff. I think they are pretty popular as recently one of my co-workers licked the top of one so he would not have to share it with anyone else. Apparently when children are not around the staff does not always model the best behavior. Next I plan on reducing the sugar in these. Divide the batter evenly between 12 muffin cups and bake in the center of the preheated oven for 20 minutes or until a toothpick or knife inserted in the center comes out clean (It can be moist from the butter but there should be no batter). Allow to cool in muffin tins, store in an airtight container. All organic foods are the healthiest food. Processed foods are the one we should avoid especially those with high fructose corn syrup.